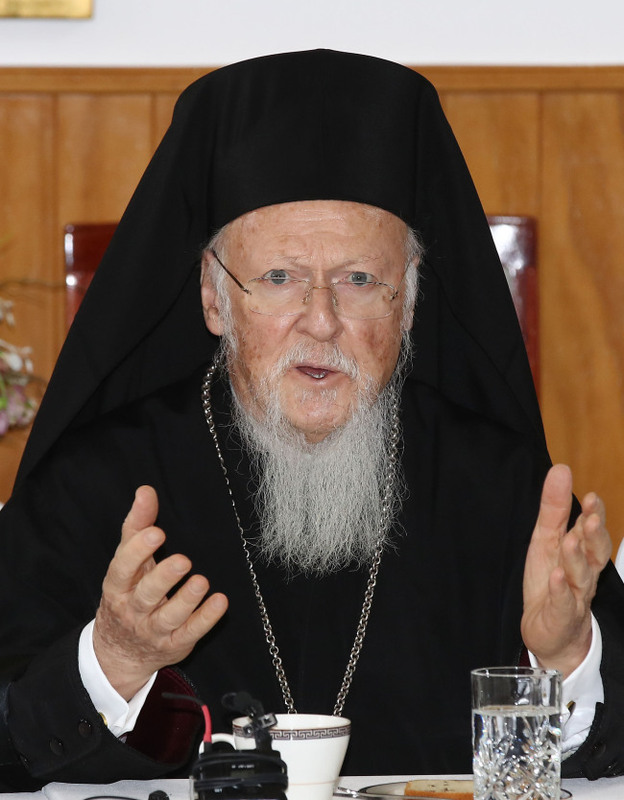 Ecumenical Patriarch Bartholomew I, widely considered the spiritual leader of the world’s Orthodox Christians, expressed support for South Korean President Moon Jae-in‘s efforts to bring reunification of Koreas closer to reality. Visiting Korea to lead a special service commemorating the 50th anniversary of St. Nicholas Orthodox Church in Seoul, Bartholomew said the Orthodox community around the world is praying for a peaceful reunification of the peninsula. This marks the fourth time he has visited Korea, whose Orthodox community is under the jurisdictional authority of the Ecumenical Patriarchate of Constantinople. “There has been good news of the US president (Donald Trump) and North Korean leader Kim Jong-un meeting recently, and I sincerely pray that the two leaders will meet again to take one step further toward reconciliation and unification,” he said at a press conference held in Seoul. He spoke in Greek, which was then translated to Korean. During his visit, he is also to hold a service at the St. Nicholas Orthodox Church, where he will lead a special prayer for peace between the two Koreas. Minister of Culture, Sports and Tourism Do Jong-hwan is expected to attend the service. On Saturday, Bartholomew will visit the Demilitarized Zone where he will lead a special prayer for peace and unification. He said that a peaceful unification should be the priority, and those opposing it may be doing so out of concern for their own economic or political benefit. “No benefit of any kind should come before love and happiness of a single (reunited) family,” he said. The leader once again reiterated his wish to grant autonomy to Ukraine’s Orthodox Church, which has been a thorny issue that greatly irks the Russian church. He mentioned that the sizeable population of Orthodox Christians in the country more than suffices for Ukraine to have an independent church. The Russian Orthodox Church recently warned that it may sever ties with the leader if he grants the Ukraine church autonomy.